Nice work! Loved the pc version. ;) Thank you, by the work. I can't get the speech output to work. I'm on a german Windows PC, I can select between "Microsoft Hedda Desktop" (german) and "Microsoft Zira Desktop" (UK/US?). Everytime I select Sound 3 in the options after the next instruction it pops back to Sound 1. What can I do? Also I would appreciate it if the key-repeat-rate could be lowered for every key except heading left/right. Hi. After I updated Windows 10, I had a similar issue with speech output. Downloading (again) the UK and US speech packs from Windows solved it. Then the app should select the voices automatically. Thanks for the suggestion. Thank you for your quick response. I've now installed both US and UK language packs, and with some planes I can hear the voice (David) but with most planes it just defaults back to sound 1. Ok, then I'll have to make some changes to make sure it selects an available voice. Expect an update later this week. it doenst work. I see the screen game only one second. after this the screen change to white. Seeing a slightly annoying bug at KATL. Occasionally aircraft will enter, and ignore any instruction to descent (their data block will change briefly, then back to cruise altitude). 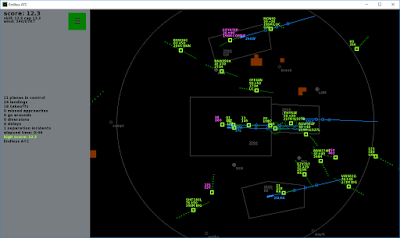 Only thing you can do is let the aircraft leave the airspace (incurring a score penalty). Thanks for reporting the bug. I think I found the cause. Expect a new release next week. Wow, that was quick! Will look out for the update. Hi, any keyboard shortcut for Desktop version? Yes, see the Manual.pdf for a list of keyboard shortcuts. To start a new game, click the airport button and select an airport. Hi, I want to ask you if you think make do a version for Apple Store?. Thank you. hello, great game, once a plane has localised, it cannot then be localised onto a different runway, which i think is either a mistake or bug as in real life atc are often switching between runways on descent. Hey, if we buy the game on the Play Store, do you issue Steam keys? Or do we need to buy a copy for each platform?